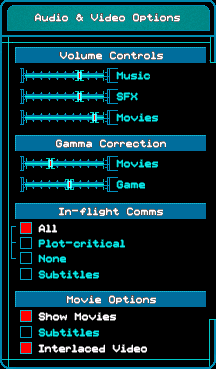 Game can be updated for higher-resolution support and DVD-quality FMV without interlacing (see Install enhancements). 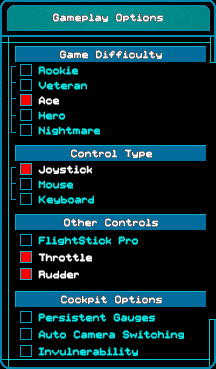 Includes Wing Commander: Secret Ops. 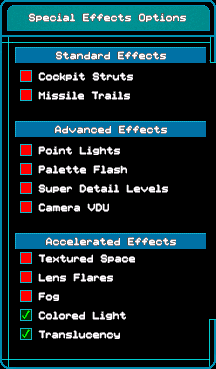 These enhancements allow higher resolutions and enhanced FMV cutscenes without interlacing. Extract into the installation folder; do not overwrite prophecy.exe if you are using the GOG.com version. Set your resolution when prompted. Optional: install the DVD Movie Upgrade Patch for DVD-quality cutscenes. If missions crash run launcher.exe in the installation folder and set anisotrophy and MSAA to 0. 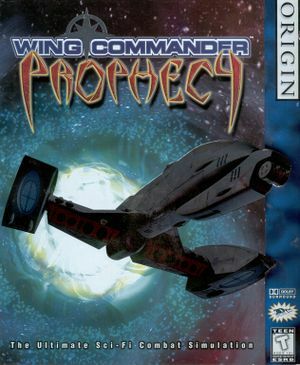 Install the OpenGL Patch and set with OGLsetup.exe..
Use the OpenGL Patch or the Wing Commander: Prophecy and Secret Ops fullscreen border fix.